The world of type has captivated printer, journalist, and writer Alix Christie since the age of 16. Making her way from coastal California to London, via Germany, the author of the acclaimed debut novel “Gutenberg’s Apprentice“ is well-traveled. A Sabbatical Homes member since 2008, we were excited to learn about Christie’s recent accomplishment! We had the opportunity to ask her about her writing process, travels around the globe, and friends she’s made renting out her Berlin apartment to fellow academics using SabbaticalHomes.com. You have an interesting, personal relationship to the print process. Can you give us a brief background of how you became involved with the subject of your book? I’ve been a letterpress printer on and off since my teens – mostly off, because I’ve lived abroad for so many years and platen presses literally weigh tons. My grandfather was a type founder in San Francisco; I learned what it was to be an apprentice from him and another fine printer in California. Still, I never expected to write a book about the invention of printing. I had finished an MFA in creative writing and written one unpublished novel when an article in the New York Times caught my eye. It reported on new research into how Gutenberg might have made his first types. That was in 2001 – it took me some time, and a move to Berlin, Germany, but that story was the spark that sent me on a seven-year journey to tell the story of the world’s most famous book. How do you feel the theme of teetering between old and new technology translates to today’s generation of readers? I only started thinking about this once I started writing and began to really understand how the printing press would have shocked and amazed people living in the late middle ages. It seemed to me very clear that we were living through as fundamental a shift – that’s why I call the invention of printing the last great media revolution before our own. If there is one thing I hope readers take away from the novel, it’s a sense that the new thing doesn’t have to completely destroy the old. New technologies are simply tools, even if they do have the potential to completely change human nature. It’s up to us to weigh their benefits and costs, and use them accordingly. It’s vital, for example, that we humans preserve our sense of wonder and beauty at the natural world and one another, in the face of such addictive new toys as the Internet and social media. What question do you wish someone would ask about your book, but no one yet has? I wish someone had asked me why it took so long! 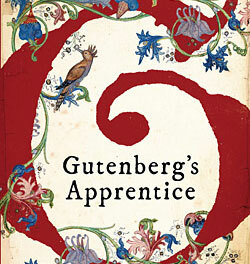 Seven years is a long time – in fact it’s the length of time of an apprenticeship in a medieval guild. Answering it would give me the opportunity to say how important it is for writers—who are parents and working people, like most of us–to have the support at home they need to go off into this other world. In my case my husband and I built a great partnership to raise our kids in three different countries while I wrote and he held a full-time job. The other piece is that we lived in the U.S., Germany and England, with two international moves, while I was researching and writing this book. What I have learned is that creative projects work at their own rhythms, like all of us, and what might seem like a delay could in fact be enriching the end product. I couldn’t have written the book without the training in the U.S., the source material in Germany, and the wealth of experts and beautiful books in London, where I live. Can you share some stories about the people you’ve met through SabbaticalHomes.com? We’ve met the most incredible people through SabbaticalHomes.com. Our apartment in Berlin was a true sabbatical home to a succession of academics from Australia, Canada, Germany who spent a year there. One of the best things was providing clever guests at dinner parties for our neighbors in the building. A particular favorite was the philosopher and his teacher wife from Princeton! In London we’ve let our flat for short breaks and our most recent visitor was a lovely woman from Belgium who spoiled our cat much more than we do with toys and grooming equipment! I feel quite confident that I could turn up in any of their countries and spend a very enjoyable evening with any of them. What’s the most challenging thing about renting your home? And how do you overcome it? For me the toughest part is tidying away clutter and making the place feel less like someone’s personal space and more like a vacation apartment. It’s a small flat and I sometimes hide things so well that I can’t find them again afterwards! On the plus side, clearing stuff away does inspire me to get rid of unnecessary junk, which is all to the good when you live in a small urban apartment. Do you have a dream sabbatical/travel destination? I would love to spend a few months in Buenos Aires. We’ve still got one child to get through high school, but in a couple of years I predict we’ll be ready to do some serious swapping!